Electricity is a significant part of your life, yet one you rarely think about. But here at Eaton, we think about it every day. We work hard to develop products that safely distribute power to your home or business. Chances are that when you go to a ball game, school or the mall, Eaton is there too, in some way, helping to bring power to your life. Magnum DS Switchgear is an assembly of metal enclosures, each housing draw-out mounted low voltage power circuit breakers. In addition to the three position draw-out Magnum DS Power Circuit Breakers, the assemblies normally include control and measuring devices such as relays, instruments, meters, instrument transformers, control power transformers, and the necessary power bus work and control wiring for AC system applications up to 600 volts. Eaton metal-enclosed front-accessible switchgear combines space-optimization with front-accessibility in a flexible and cost-effective design. 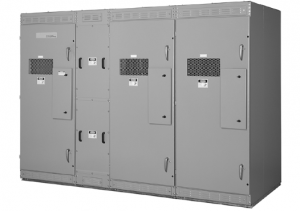 Designed for applications at voltages up to 15 kV, the metal-enclosed front-accessible switchgear features a wide variety of configurations, standard drawing packages, intelligent integrated trip units and reduced clearance installation. Featuring high interrupting and short-time withstand, reduced weight, broad trip-unit capabilities, and an ergonomic handle design tested to 20,000 mechanical operations and 10,000 electrical operations, Series NRX provides the capabilities of a power circuit breaker in the compact size of a molded case breaker. Series NRX meets UL 1066, UL 489, and IEC 60947-2 requirements and is certified for 65 kAIC interrupting with 42 kAIC withstand at the 380-508 VAC range. Eaton’s Medium Voltage Switchgear provides centralized control and protection of medium-voltage power equipment and circuits in industrial, commercial, and utility installations involving generators, motors, feeder circuits, and transmission and distribution lines. These products also qualify for LEED credits. Arc-Resistant Low Voltage Switchgear is utilized in the protection, controlling, and monitoring of low voltage distribution systems. It has been successfully tested to ANSI C37.20.7 at KEMA-Powertest, and has been UL witnessed and certified. Arc-Resistant switchgear is ideally suited for all types of industrial, commercial and utility applications with distribution systems rated 600 volts or below. VacClad-W switchgear is available in maximum voltage ratings from 4.76 kV through 38 kV, and interrupting ratings as shown below. VacClad-W offers a total design concept of cell, breaker and auxiliary equipment, which can be assembled in various combinations to satisfy user application requirements. Two-high breaker arrangements are standard up to 15 kV. One-high arrangements can be furnished when required.